… The fear starts when you feel you are someone, specifically when every one of us feels that we are important, for ourselves. But today when we flew from Kabul to Bamyian with a USAID Helicopter, we reached Maidan Shahr, the area that is strongly influenced by Taliban. The helicopter slowly started rising, and the passengers, all journalists, seemed worried. I don’t know, or may be it was only me having fear. Fear of becoming a victim of some guided missile which recently the Taliban are equipped with. 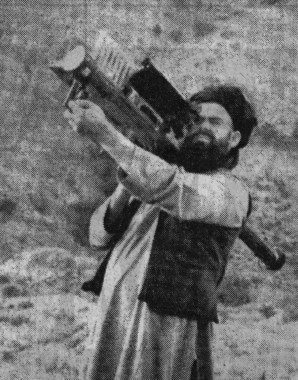 It will not be a surprise to hear that the Taliban are equipped with such a missile. Just a few weeks ago, there was a deadly US helicopter crash caused by a stinger guided missile in southern Afghanistan. As you will remember, our USA friends had equipped the Afghan warriors “Mujahideen” with their latest weapons in the times of the holey invasion of the Soviet Union. And today these guided missiles are used against US forces in Afghanistan. In 2005, in a report at RTA TV was told how these missiles got out of work in the times of civil war, but recently the ISI had repaired them for the Taliban, in order to target the US aircrafts. If this news is right, NATO forces will have big challenges in the struggle against the Taliban. However, Pakistani authorities announced that this is a baseless claim by the US. A report published by the Pentagon says that more than 250 Soviet aircrafts have been crashed by these missiles in the time of Soviet Union invasion in Afghanistan. So... until we didn’t cross the Onai pass, every one of us was in fear. Fear of the possibility that a missile could hit us. And now I am in Bamyian, where the Buddha Statues where blown up by the extremist Islamists of the Taliban. I am here, invited as a speaker in a two days seminar which is funded and organized by UNAMA and the US embassy to celebrate peace day. I'll have to analyze, and focus on the impacts and roles of digital media and blogs, in -promised visions of- peace, security and democracy in Afghanistan, over the last 7 years.